THIS IS A ONE OF A KIND LOCAL ONE OWNER 2015 SPECIALE. CUSTOM ORDERED NEW BY ITS CURRENT COLLECTOR OWNER WITH THE FOLLOWING EQUIPMENT. ROSSO SCUDERIA PAINT, FERRARI AFS SYSTEM, YELLOW BRAKE CALIPERS, SCUDERIA SHIELDS, CARBON FIBER ENGINE COVER, FRONT AIR VENTS IN CARBON FIBER, SUSPENSION LIFTER, LEATHER UPHOLSTERY, PARKING CAMERA, REAR PARKING SENSORS, NART RACING STRIPE, AND MUCH MORE. THIS CAR IS SHOWROOM NEW. NO DINGS OR NICKS. NO PAINTWORK OR DAMAGE, STORED IN A CLIMATE CONTROLLED GARAGE UNDER A COVER ON A CHARGER. NEVER TRACKED, NEVER ABUSED, ONLY DEALER SERVICED, ETC. GAS MOTORCARS INC IS A FAMILY OWNED AND OPERATED DEALERSHIP LOCATED IN MARIETTA, GA. WE ONLY SELL VEHICLES OF THE HIGHEST QUALITY. 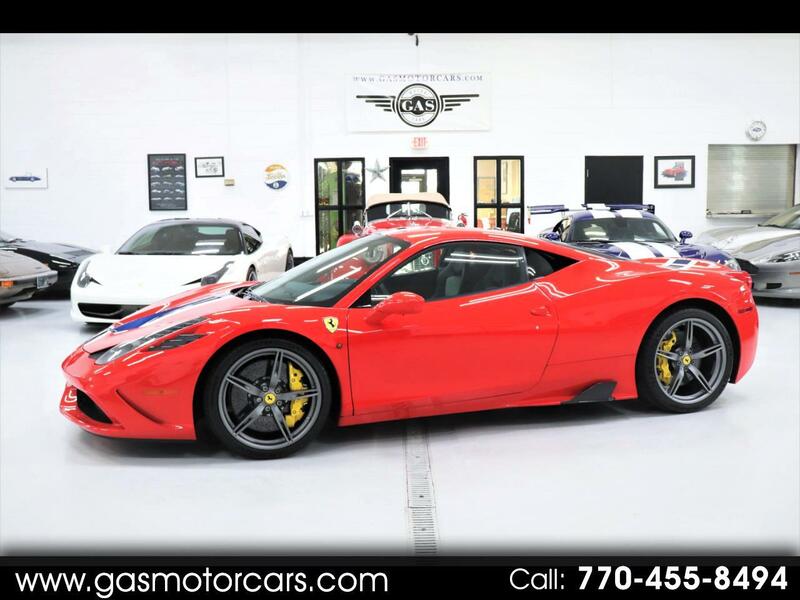 Visit Gas Motorcars online at www.gasmotorcars.com to see more pictures of this vehicle or call us at 770-455-8494 today to schedule your test drive. Message: Thought you might be interested in this 2015 Ferrari 458.